Thanks for popping in. Monday, Monday. 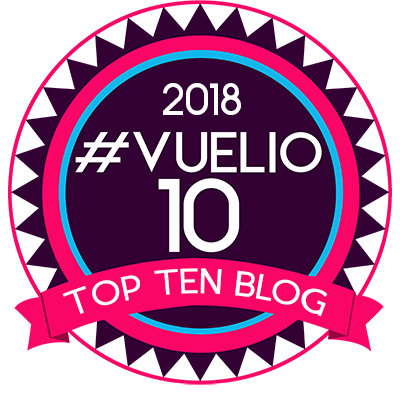 New Blog Direction! We were having a meeting recently, and the Products of the Month came up. 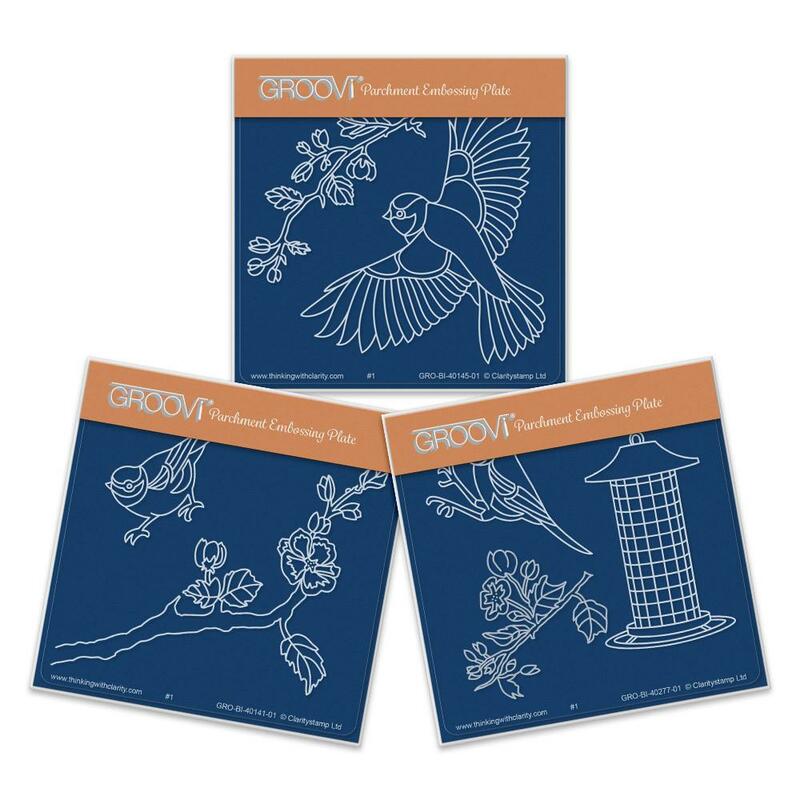 Did you know that every single month, 12 months a year, we launch a Product of the Month for all 4 of our core products: Stamps, Stencils, Groovi and now Fresh Cut Dies. Those products are reduced by 33% for the entire month, PLUS your Clarity Club Discount. Well worth further investigation, methinks! For inspiration, please allow me to reach into our extensive library of artwork samples, and select a lovely piece from one of our very talented Design Team members, Jane Telford. Jane has very kindly written out the instructions for us too. Thank you Jane! On plain A4 parchment emboss the large bird. 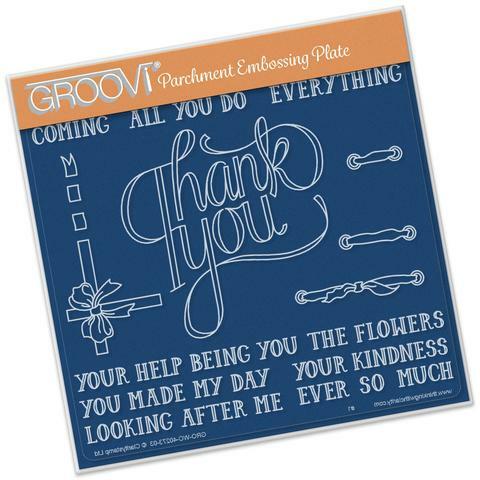 Emboss the Thank You to look like the bird is holding it, then emboss the small bird. Emboss the frame around the birds using the square, extending the lines to fit evenly around them. Emboss the branches, leaves, and flowers. 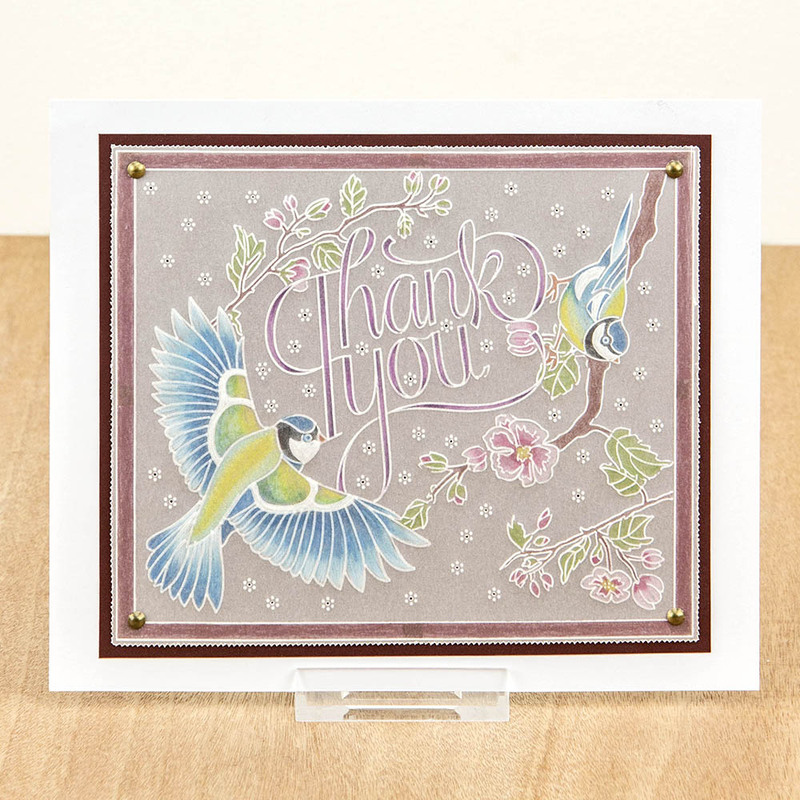 Emboss little dotty flowers using the diagonal grid randomly around the birds and the Thank you. On the reverse, emboss the white work on the birds as shown. Add colour using the blendable Perga Liners blending with Dorso oil. Perforate in the centre of the dotty flowers and around the frame. Cut away the waste. Attach to brown card with brads and attach to a card blank. For a FREE digital download of this project, click HERE. Why not print off and collect these weekly downloads in a folder, so that you have an instant Go To for inspiration? The product of the Month offer lasts all month, but next Monday, let’s shed some light on Tina’s beautiful Flower Stamps! A wonderful piece of artwork Jane, so fresh and springlike. I always mean to download these inspiration sheets so I am going to make it my January Resolution to do them and put them in a folder so they are always at hand. I always download the inspiration sheets and then forget to go back to them! I must make a point of doing that this year. What a lovely idea. Thanks to you for the reduced price products and to Jane for the instructions which I am sure will be greatly appreciated by all. THANKS too for the package received on Saturday. My favourite cough jollop is no longer made and nothing else works for me so looks like I will have to grin and bear it!!! On the plus side, no appetite, does wonders for the diet. I really did enjoy doing this project. That garden bird is one of my favourite Images and thought it would look great carrying the Thank you ribbon. Thank you for highlighting it on your blog and hope that people have fun with the instructions! If anyone does have a go please let us see it on groovi worldwide. Be kind to yourself whatever happens. Don’t worry too much Donna, things always work out eventually. I had a very stressful job but couldn’t see my way to giving up. Cancer forced the issue and it was the best thing that could have happened to me as I could give up work with no guilt. It was such a relief. Now 20 years on I’m relatively healthy and my mind is my own. You must make the right decision for you. Gorgeous card Jane. Love the idea of focusing on a different offer each week. Hi Joy. If you have these images as stamps you could make a similar Inky version! What’s great idea, I look at the email when it comes through but often forget to revisit the website to order something I have had my eye on. This will be a lovely reminder. The inspiration sheet is a great idea and Jane your design is beautiful, thank you. Hope you enjoyed your pottery throw down on Saturday, your big pot is great. .
Beautiful Project by Jane, I really must make time to attempt these inspiration pieces.